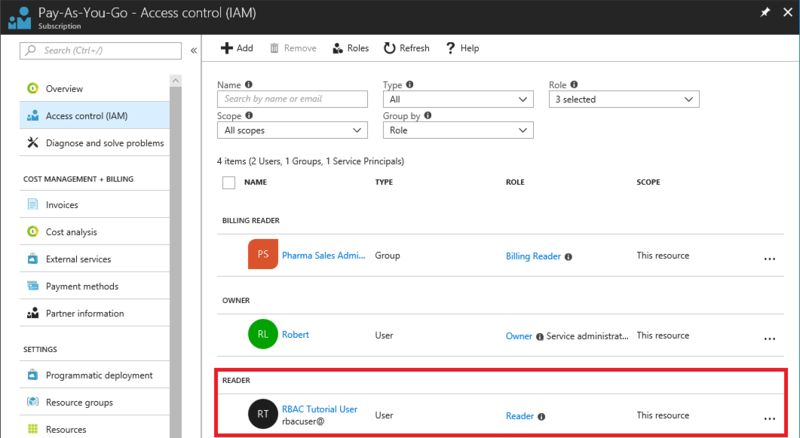 Role-based access control (RBAC) is the way that you manage access to Azure resources. In this tutorial, you grant a user access to view everything in a subscription and manage everything in a resource group using Azure PowerShell. To assign a role, you need a user, group, or service principal. If you don't already have a user, you can create one. In Azure Cloud Shell, create a password that complies with your password complexity requirements. Create a new user for your domain using the New-AzureADUser command. -UserPrincipalName "rbacuser@example.com" -AccountEnabled $true -MailNickName "rbacuser"
You use a resource group to show how to assign a role at a resource group scope. Get a list of region locations using the Get-AzLocation command. Select a location near you and assign it to a variable. Create a new resource group using the New-AzResourceGroup command. To grant access for the user, you use the New-AzRoleAssignment command to assign a role. You must specify the security principal, role definition, and scope. Get the ID of your subscription using the Get-AzSubscription command. Save the subscription scope in a variable. Assign the Reader role to the user at the subscription scope. 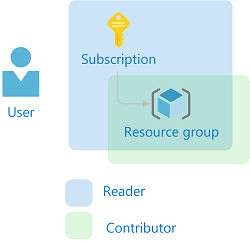 Assign the Contributor role to the user at the resource group scope. To verify the access for the subscription, use the Get-AzRoleAssignment command to list the role assignments. In the output, you can see that the Reader role has been assigned to the RBAC Tutorial User at the subscription scope. To verify the access for the resource group, use the Get-AzRoleAssignment command to list the role assignments. Get-AzRoleAssignment -SignInName rbacuser@example.com -ResourceGroupName "rbac-tutorial-resource-group"
In the output, you can see that both the Contributor and Reader roles have been assigned to the RBAC Tutorial User. The Contributor role is at the rbac-tutorial-resource-group scope and the Reader role is inherited at the subscription scope. 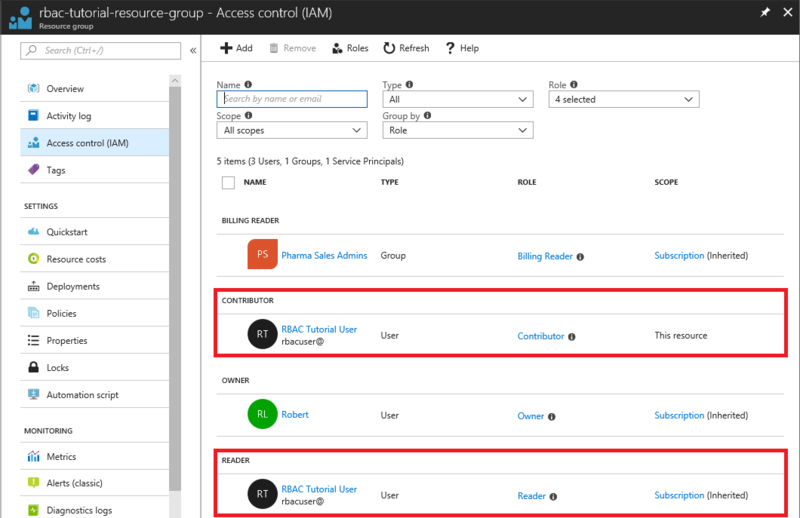 To see how the role assignments look in the Azure portal, view the Access control (IAM) blade for the subscription. View the Access control (IAM) blade for the resource group. To remove access for users, groups, and applications, use Remove-AzRoleAssignment to remove a role assignment. Use the following command to remove the Contributor role assignment for the user at the resource group scope. Use the following command to remove the Reader role assignment for the user at the subscription scope. To clean up the resources created by this tutorial, delete the resource group and the user. Delete the resource group using the Remove-AzResourceGroup command. When asked to confirm, type Y. It will take a few seconds to delete. Delete the user using the Remove-AzureADUser command.